Happy May The Fourth! I usually reserve this date to blog about something Star Wars related, and well, I don't consider this an exception. When I think "Star Wars", nothing comes to mind faster than three of my favorite people: George Lucas, C-3PO, and Bonnie Burton! If you follow any sci-fi social circles, than there is no way you haven't heard of Bonnie. If social media was a universe, Bonnie would be its Overlord. Photo 1: In addition to connecting the world to the greatest sci-fi and fantasy info out there, Bonnie is also an accomplished author, host, and crafter. Through her travels and networking, she has amassed a very impressive list of artistic friends, so she decided to host an art show at the Ltd. Art Gallery in Seattle. The show is called TENTACLES, and it opens today! 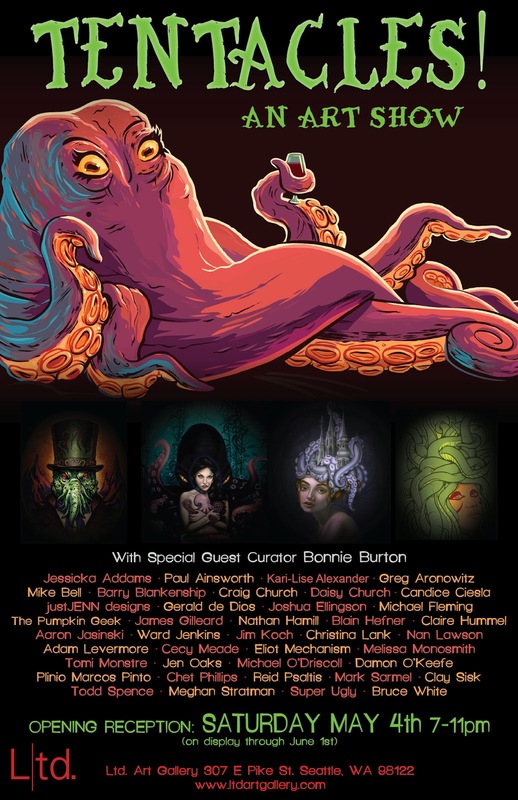 I was honored to be asked to show at Tentacles, and to be listed among all of these stellar talents. Be sure to check out everyone's work for the show here, and if you are in the Seattle area, definitely stop in! Photo 2: This is my piece for the show! I first instinct was to do something with the Sarlacc pit, since I felt I was doing this piece FOR Bonnie, and we share such a strong common love for all things Star Wars. But then I felt that EVERYBODY would probably do something Sarlacc, so I decided to go in a different direction. 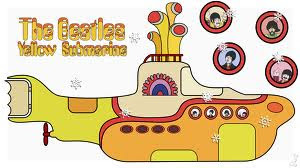 I came up with several ideas for paintings, but the idea I liked the most was for a sculpture of the Beatles' Yellow Submarine being snagged by the Giant Squid from 20,000 Leagues Under the Sea. Photo 3: My concept was to build a version of the Yellow Submarine that captured the bubbly feel of the 60's original, but was constructed with the same aesthetic of Disney's Nautilus. Photo 4: I found this profile of the Yellow Submarine on the interwebs. Photo 6: With so little time, I needed to let go of the hope of making molds and castings.This piece would be a one-off, and I would be shipping the original. So I had to use strong, light materials that were workable, yet permanent. I decided to go with Bondo auto body filler. I'm sure that is a rare medium for art galleries! But it's quick and reliable! I started by cutting the Yellow Submarine profile out of sintra plastic, and then I created a plan view and cross sectioned them. Photo 7: I added a few more planes of sintra to help me navigate the shape, then loaded the whole thing up with Bondo. I did smaller batches and layered it up, as trying to put a massive amount all at once causes the material to get very hot as it catalyzes, and this can cause the sintra to warp. I used an xacto knife and a rasp to shave the Bondo into shape as it kicked. Doing this before it fully cures help speed things up, since it turns rock hard after it sets all the way. Photo 8: Once I got all of the shapes blocked out on the sub, I sanded the whole thing to smooth it out. Then, using a blueprint of the Nautilus I found, I marked off the various panel lines and iron framework typical of the Jules Vern era. I used a razor saw, and xacto, and a file to etch in all the panel lines. Then, I used a pin vice to drill in all of the rivets. This took longer than anything! Photo 9: With the sub well under way, I turned to the tentacles. I ran out to a local marble dealer and found a nice scrap of onyx to use as a base. This actually determined the entire scale of the sculpture. I pulled a wooden base of the same size and drilled holes in it to mount 1/4" armature wire that I shaped into the tentacles. I used the sub to figure out the exact positioning of the curls. Then, I wrapped the wire with aluminum foil to add some bulk. Photo 10: Then, back to Bondo. Layer upon layer, I built up the tentacles. Occasionally, I would rasp the surface to take off all of the drippy spikes that grew from trying to apply a liquid vertically! Photo 11: After I felt I had enough Bondo on the pieces, I rasped and sanded them into the final shape. Then I spent the rest of the day, and way into the night, applying Magic Sculpt Epoxy rings to create suckers. Luckily, I had the lovely Marissa Cuevas pre-mixing the two part epoxy and rolling it into little ringlets to speed the process up. Photo 12: Some final model work on the sub, and it was ready to be attached to the tentacles. Once the sub was secured, I popped the tentacles off the wood base and mounted them on the onyx. The whole sculpture was sprayed in DAP Bronze Metallic finish, which is a rare, out of manufacture spray paint that I horde and save for special occasions, because it really does look like bronze. I cleaned the piece up, took some pictures, and managed to get to FedEx about 20 minutes before the cutoff! Now, the final piece of the puzzle is the title. I wanted to name it something that connected The Beatles with the classic seafaring story. I came up with two names, and there is a split decision here at the BarnYard. So I'm asking all of you to help me out! 20,000 Hits Under The Sea vs.
Octopus's Garden At 20,000 Leagues. May the Fourth be with you, all days! I've been following your blog for a while (yes, I am the one :-) ). We don't have Bondo down here, we do have many similar automotive body fillers. To help finding an approximately equivalent product from what is available, which Bondo product are you using here? Wow! Truly amazing! thank you for sharing your process, love it. I would go with Octopus's Garden, but either is good. Thanks again! Just heard Matt Austin is trying to get the SPD cast back together for a reunion! It'd be awesome if you designed some cool stuff for it.